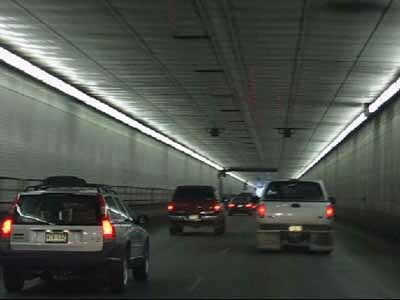 The Eisenhower Tunnel ( full official name : the Eisenhower-Johnson Memorial Tunnel ) is a vehicular tunnel located on Interstate 70 approximately 60 miles west of Denver, Colorado. The tunnel was built under the Continental Divide, and at 11,158 feet (3,401 m), is the highest vehicular tunnel in the world. It is also the longest tunnel built under the Interstate highway program, and one of the last major pieces of the system to be completed.